Early indications are that Cyber Monday sales will be as strong as retailers have been hoping, as consumers continue to blur the lines between on- and offline shopping. 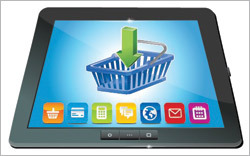 By 3 p.m., IBM Benchmark reported that online sales are up 25.6% over last year. Even more remarkable than those gains, experts say, is the fluidity with which consumers are now able to shift focus from online to brick-and-mortar shopping: comScore reports that for the first time, online sales on Black Friday -- the day usually associated with madness and mayhem in physical stores -- broke the $1 billion mark. And many retailers are hawking “cyber” specials in their brick-and-mortar stores. Still, the vast majority (88%, says Shop.org) cybershop the old-fashioned way, using a computer while at home. But 12.4%, or roughly 16 million, also said they planned to shop from their computer at work. And retailers have been holding out rewards for those who do so: The trade group says 85% of the retailers it surveyed are offering a promotion just for Cyber Monday.